Smok knocks it out of the park again with another beautifully well crafted Mod Kit. The Procolor series highlights the users chosen kit color from top to bottom! The OLED screen is set onto the very middle in the shape of a Crest. The OLED screen has a high tech operating interface and displays your battery life, ohm resistance, mode, wattage output, etc. Layered on the bottom of the OLED Crest design is the plus and minus sign to adjust the wattage. The Wattage can reach all the way to Smoks signature 225 Watts. 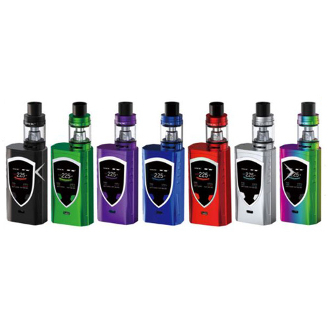 The ProColor Kit is powered by two 18650 batteries and can be recharged using its passthru feature.